Written By: Seth Roberts, Ph.D. Psychologist and professor Seth Roberts has spent years analyzing why most diets don't work. A maverick with a curious mind, and a yen for self-experimentation, he started by asking a simple question most experts haven't tackled: What makes us feel hungry in the first place? After scouring the scientific literature and tirelessly testing various theories and practices, Roberts hit upon a simple, effective strategy for controlling the body's internal 'set point'-that is, the thermostat that controls weight gain or loss. In lowering his set point, Roberts was able to lose thirty-five pounds in only three months, and he has kept it off for five years. With the publication of this unique and groundbreaking book, Seth Roberts's program will be available to anyone who wants to lose weight-a little or a lot-and keep it off. 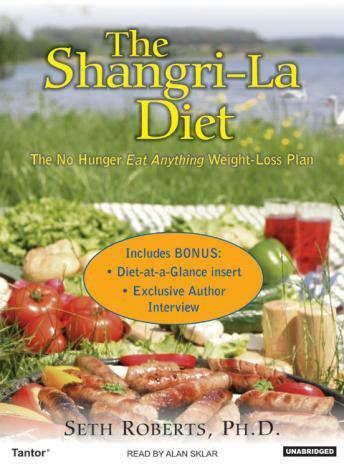 The Shangri-La Diet includes specific instructions for tailoring the program for individual needs and goals, as well as expert tips, variations, success stories, and an illuminating explanation of how Roberts devised the diet and why it works so well. A diet program simple enough for anyone to try, The Shangri-La Diet has the potential to radically change the way we think about weight loss-and deliver remarkably easy, sustainable results.